(Beauty Hula MM16) Happy Seniors dancing to Beauty Hula. Groove along gently with us here in this Senior MUVE dance exercise video. MUVE dance-along exercises for seniors are a great way to loosen up and get all body-parts moving. They are not only workouts to get in shape, but also a great way to relax and reduce stress.This spontaneous dance along is from the beginner dance exercise dvd Mellow MUVE. 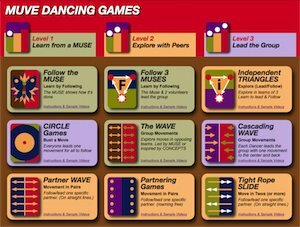 It features easy dance steps that anyone can do. The best part is that you can invite your whole family to join you in this easy dance workout. Because all movements are customized to each dancers needs, your children and grand children can dance exercise with you right at home. The only way to really know what these spontaneous dances feel like is to actually do them! You will be surprised how easy it is to let yourself be inspired by the music and the easy moves, that's what makes working out fun with MUVE.